Boeing's solar/electric-powered high altitude long endurance unmanned aerial vehicle, SolarEagle, has clinched a $89 million deal with the US Defense Advanced Research Projects Agency (DARPA) to develop and fly the unmanned aircraft capable of staying aloft for up to five years. 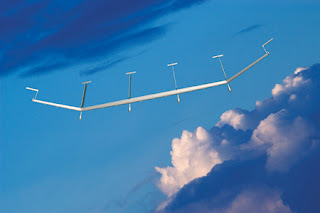 "SolarEagle is a uniquely configured, large unmanned aircraft designed to eventually remain on station at stratospheric altitudes for at least five years," explained Boeing spokesperson Pat O'Neil. "that's a daunting task, but we have a highly reliable solar-electric design that will meet the challenge in order to perform persistent communications, intelligence, surveillance and reconnaissance missions from altitudes above 60,000 feet." According to O'Neil, the SolarEagle demonstrator is slated to remain in the upper atmosphere for 30 days during testing - harvesting solar energy that will be stored in fuel cells and used to power the aircraft at night. The unmanned aircraft will also boast highly efficient electric motors and propellers, along with a high-aspect-ratio, 400-foot wing for increased solar power and aerodynamic performance. O'Neil noted that the SolarEagle was only one of Boeing's rapid prototyping projects. "efforts include the Phantom Ray, a fighter-sized, unmanned, advanced technology demonstrator scheduled to make its first flight in early 2011. "The hydrogen-powered Phantom Eye demonstrator, a High Altitude Long Endurance aircraft designed to stay aloft for up to four days, also scheduled to make its first flight in 2011." The SolarEagle is expected to make its first demonstration flight in 2014. Wouldn't it be more logical to use a ballon/aiship for something like this?